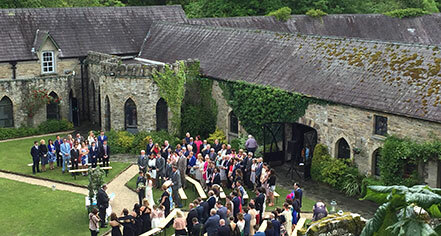 Kinnitty Castle Hotel is the perfect choice for civil and blessing ceremonies in Ireland. Why not choose to get married in a luxurious and romantic Castle setting where you and your guests can enjoy and relax in the privacy and elegance of Kinnitty Castle Hotel. Discuss with the events team about using the Great Hall of the Carroll’s and the other unique rooms in the Castle for civil ceremonies and blessings. 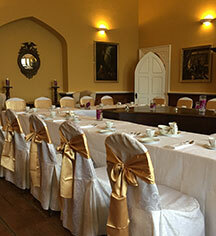 The Great Hall of The O’Carroll’s can cater for groups up to 200, while the Castle offers areas perfect for intimate weddings for a maximum of 30. Catering can accommodate for any dietary requirements for guests of the event. Whether it's summer punch in the Courtyard, mulled wine in the Castle, cocktails in the bar, dinner by candlelight, or dancing until the early hours, the events team will make it a day to remember. With 37 distinctively styled en-suite guestrooms, guests will end the joyful day with perfect accommodations.